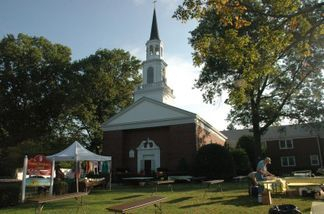 Methodists have been a presence in Huntington since 1806, when Peter Hill formed the first Methodist Class here. Meetings were held in homes until 1829, when the first worship service was held in the new church on Main Street. This building (pictured at right) was simple in design, with no steeple or other adornments. In 1837, the Methodists from Huntington Harbor, feeling it was too far to go to Main Street, built a lecture room on Park Avenue. The basement was rented for use as a school. In 1844, this building was sold to the Bethel African Methodist Episcopal Church which has used it ever since. 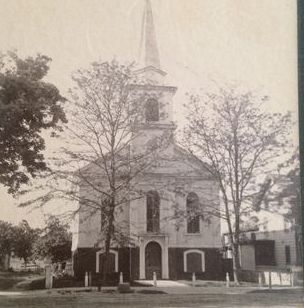 In 1863, the first Methodist Church on Main Street was partially torn down and a new church built (pictured at left). This building had a steeple and a bell. 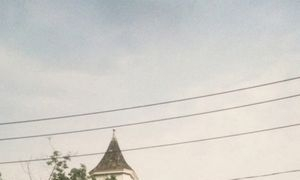 In 1880, a weather vane was placed on the steeple. The Long Islander said, "It is one of the most useful and showy in the village." In the early 1900's, to meet the needs of a growing congregation,the building was again expanded. 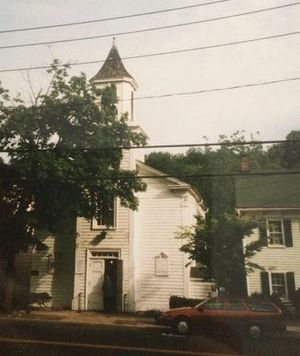 In 1842, a Methodist Church was built on Main Street in Cold Spring Harbor. Five years later, the Baptists in Cold Spring Harbor completed a chapel almost directly across the street. In 1957, the Methodist and Baptist churches in Cold Spring Harbor, which for many years had served the needs of the community, cooperating well, decided that the expense of the two churches was not justified and voted to merge. In the 1950's, the Methodists purchased property on West Neck Road and Tanyard Lane, the site of our present church building and moved North from Main street. After years of cooperative service to the neighboring harbor communities, the Community Methodist Church in Cold Spring Harbor and the United Methodist Church of Huntington merged, forming the United Methodist Church Huntington-Cold Spring Harbor. Today we are one unified spirit moving forward in service to God and our communities.